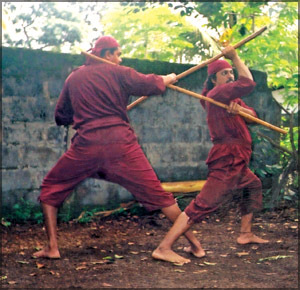 ANGAMPORA: Asia has been the breeding ground for most of the Martial Arts which exist today. Karate, Tae-kwon-do, Judo, Kung-fu which has come from the Eastern Asia and many others have become popular through generations over hundreds of years but there are many that are not recognised today. Though many Sri Lankans are not aware there are also the inherited great martial arts which is hundred or maybe over thousand years old. 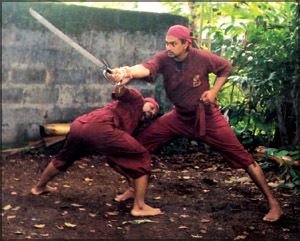 The name which stands on top among our own martial arts is the ‘Angampora’. The start of this art goes back to the period of King ‘Rawana’. Over the centuries the art of the game was hidden in the history. The re appearance of the game came out at the ‘Beligal Korale’, which is currently known as the area around Kegalle. Among the two main divisions of the game named ‘Sudaliya’ and ‘Maruwalliya’ which are two generations, the Beligal Korale was the land for the most widely spread one which is the Maruwalliya. There are some differences between the two types, but it is said that both types originated from one basic game. The generations of both these two categories exist today. The heroine of the current Maruwalliya is known as ‘Menike’ or the ‘Disapathiniya’ who is known to be lived around 400-500 years ago. She is said to be a real heroine who was dressed as a man and fought with the warrior that killed her father and defeated him with the help of Maruwalliya. This deadly fight has taken place at a pit called ‘Ura Linda’ which means ‘pig’s pit’ where the two worriers fight inside the pit and the king and the spectators watch it from outside. Her art of fighting came along securing the true art of Angampora for centuries and the generation after generation inherited it from their ancestors. Arachchillage Vageesha Wickramawansha Bandara is one of them. He was an energetic product of Ananda Sastralaya, Kotte. When he was a teenager, he spent most of his time with his grandfather, who has determined to carry the art of Angampora to the next generation. Fortunately for Sri Lanka his grandfather taught him all he knew about Angampora so that he can master the game. Fulfilling his grandfather’s wish, he was a master of the art at a very young age. interested in exercising it. He was very different from others. He was concerned in religious activities and really interested in yoga and meditation techniques. He mastered the Yoga and Meditation techniques in India and returned back in 1991. After the comeback, he started a rehabilitation centre for drug addicts with the hope of bringing them to the good path using his knowledge and abilities. As the time passed out, the Angampora chapter re-entered his life. Some people who pretended to have mastered the game, appeared from various parts of the country. They started to market this art and were creating a wrong impression among the community. But the truth was, they were never real masters of the game, nor they knew all the areas of the true art. They were only chasing for financial benefits they could gain trough the misusing of a valuable and deadly game. He came out to the public with a mind of being a challenge to the fake masters and to perform something for the sake of an obedient society. As a result, he started ‘Viswaja Vinthera’ a martial arts training centre registered under the Government, in Maharagama to popularise the true art of Angampora along with his yoga and meditation systems. The game of Angampora is made to kill and the fighting art is based on the moves of a tiger. In the early days, when the foreign invasions took place, the Sri Lankan worriers used this martial art to overcome them in certain occasions. Even when the Western nations invaded Sri Lanka, the native worriers frustrated them with their abilities. 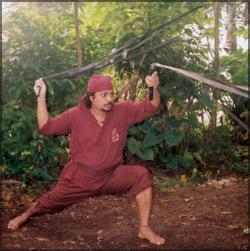 It is said that Angampora has some influences on ancient South Indian martial arts to a certain extent. But Bandara said that still this martial art is 95 percent Sri Lankan. There are many equipments used in Angampora. Suruttuwaluwa which is made of few stripes like long blades, swords, cane sticks and Kattala are some of them. The movements like fighting and foot fighting, various kinds of Angampora actions called ‘Geta and sellam’ which are the main ingredients in the game are taught to the students of ‘Viswaja Vinthera’. A basic theory in the ancient Angampora was that the early worriers did not fight with the flag bearers, drummers those accompanied the worriers at the frontline and the women. But over the time, even women have been involved in this game and there are many girls training under Bandara now. The students are taught, Yoga meditation, various kinds of seated meditations such as ‘Padmasana, Siddhasana, Shwasthikasana’. Though the game is made to kill, now it is mainly focused on tough discipline, meditation and physical exercises which leads to a better society. This is the only place in Sri Lanka where Angampora is taught with Yoga techniques. There are some shots focused on nerves and blood circulation system and a correct shot at the correct place could stop the blood circulation or even deactivate the nerves in a selected are. “This can be used to cure some illnesses like artherities, some sexual weaknesses and some eye deceases too. There are some secret medications to defend the deadly blows of Angampora itself” said Bandara. These secrets were earlier taught only to selected men of Maruwalliya generation but for the sake of the game and because the game has to be long lasted, Bandara has decided to teach this game to some selected men. However not all the students are taught everything and strict discipline is needed to succeed. The finer part of the game is taught only to the most trusted and faithful students. “In the early stages, the students are punished for even the simplest of mistakes. There are more than 300 students currently under his guidance and about 20 students with the best spirit of the game under me” noted Bandara. A new student should undergo some serious training on fighting and meditation and has to master 10 games for about a year. A student has to pass a test which he has to perform the 10 games which he mastered during the period. He then qualifies for armour training. At that stage, he receives the ‘Rudraksha’ which is worn as a necklace and a pendent which is made of secret plant seeds and leafs. it is said that it controls the stability of the heart beat of the warrior. “We are very grateful if someone is willing for a sponsorship to get this to the world. The world must know that we have inherited such an important martial art that can challenge any other martial art. We are ready to perform in front of anyone, but we are not ready to be a commercial item” Bandara says. Recently with the help of the Urban Council of Maharagama and Maharagama Police, Bandara and his students performed their art in front of thousands of people who were gathered at the Maharagama city centre without any concern of pouring rain. He is willing to perform this kind of show annually. “I’m ready for a deadly fight face to face with anyone who challenges me for the sake of this true art. I want to teach a lesson for those who wrongly pretend to have mastered this valuable art” added Bandara. He can be contacted at, 678, Temple Road, Maharagama.